Similar in appearance to wrought iron fence, ornamental, aluminum or steel fencing is the most popular and cost-effective alternative to wrought iron. Once our experienced installers have completed the job, customers are left with an attractive truly maintenance-free fence. Fence By Maintenance Service offers ornamental fences in different heights, styles, and grades; residential, commercial and industrial grades. 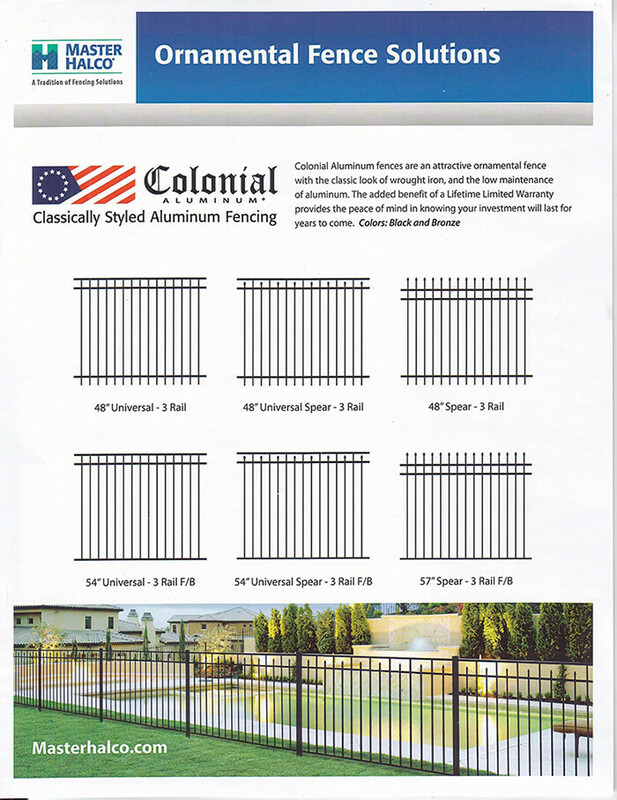 Ornamental fencing is available from 36″ to 96″ high, with many different post size and thickness options. Pickets range in size from 1/2″ to 1″ square. This fence comes standard in black or bronze; also many other custom colors are available upon request. The aluminum construction will not rust and combined with an industry leading powder coated finish our aluminum ornamental fence is able to with stand intense moisture and chemical exposure making it ideal for swimming pools. Not only is it a great for around swimming pools the extremely durable powder coated finish is highly resistant to fading and peeling making it a perfect option for whatever your needs may be. Ornamental fences are prefect for front lawns, surrounding your swimming pool or to complete your entire yard. With so many ornamental products on the market today making an informed decision is very important to your satisfaction. Not all fences are created the same, when comparing prices make sure to also compare product size, material thickness and product coating into your final decision. This will help to ensure your satisfaction because just like in any industry the bitterness of a poor product remains long after the sweetness of a cheaper price.